Our special-needs-friendly tips and activity adaptions are easy for teachers to identify and use! Look for the Special Needs Friendly symbol throughout the teacher guide to identify activities that work well for all kids, including those with special needs. The Special Needs Friendly symbol also points to helpful tips and activity adaptations found on each age level’s Resources CD. Whether you know it or not, there are probably kids with special needs in your Sunday school program. Maybe they have auditory or visual difficulties. Maybe they’re on the autism spectrum. Or maybe they have learning challenges. With HeartShaper, you can reach kids with special needs and make a difference—in a child’s future, in a family’s church experience, and in your church and community. 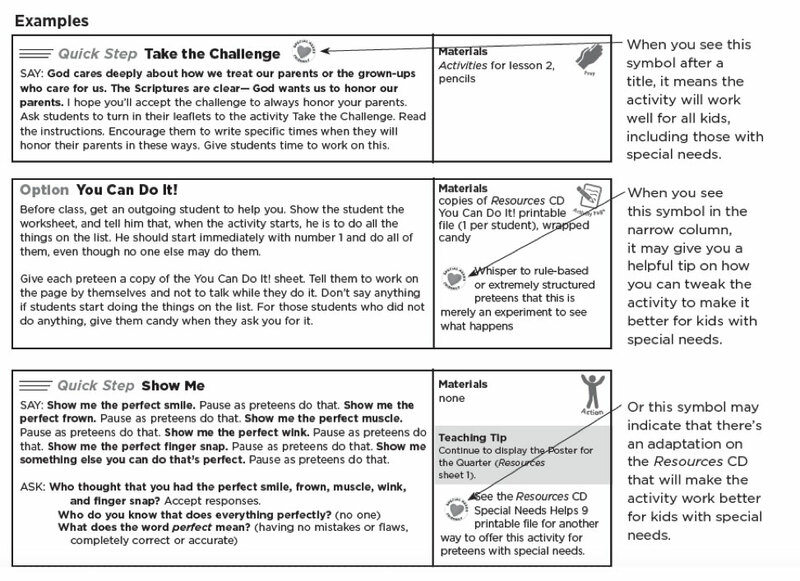 HeartShaper provides the resources you need to adapt lesson activities so you can include kids with special needs in your Sunday school. Watch this video and see how it works! Take a look at this classroom demonstration to see how an activity works with and without the special needs adaptations. HeartShaper makes it easy to adapt activities so you can include every child in each step of the lesson. We hope you’ll take the time to watch this video and realize that you can do it too!